Ask most type 1 diabetics when the last time they changed their lancet was. For a lot of people, myself included, it could be over a month (possibly a few) since we last changed the needle used to prick our fingers. Why is that? That’s a good question. I think for me, I get into a routine. Poking my finger becomes automatic, and changing the lancet becomes another step, one that I don’t typically think about. 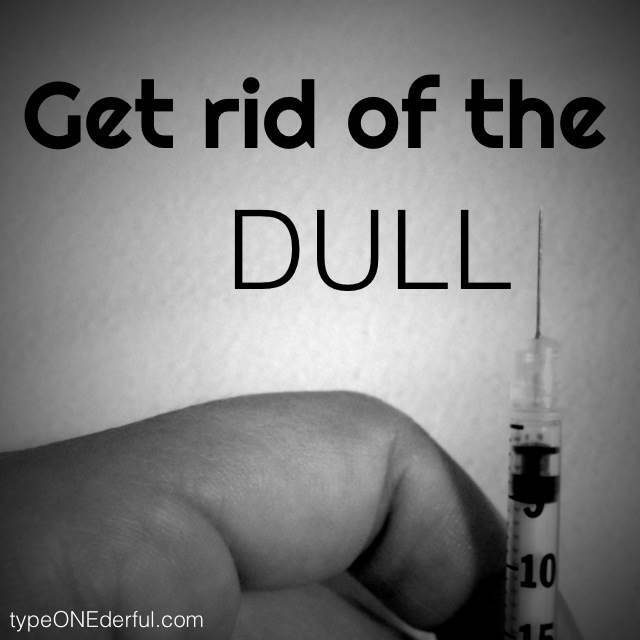 But consider this: the more you use a needle, the duller it becomes. And when it comes to needles, dull needles are actually more painful than sharp ones. So really it is in our best interest to switch things up, to replace an old dull needle with a new, sharp one. Yes it takes a little more effort and conscious thought, but in the end, it’s to your benefit. Get rid of the dull. Everyone has their routines. Routines can be comforting. They let you know what to expect so that you aren’t caught off guard or in an uncomfortable situation. They bring familiarity, safety, and peace of mind. But routines can get old. They can become boring. You can become stuck in your patterns and rituals and forget to step outside of the safe and familiar to try something new and different. Leaving your comfort zone takes effort and thought. It’s not always easy to do. But like switching to a sharp needle, taking risks can introduce unforeseen benefits to your life. It opens you up to new possibilities and experiences. It teaches you new things. It enriches your life in ways that you can’t imagine, and it helps you grow as a person. I’m not saying that all routines are bad, but take a moment to think about the areas in your life where the needle is starting to become dull. Maybe it’s time to change life’s lancet. I think you’ll be glad you did.